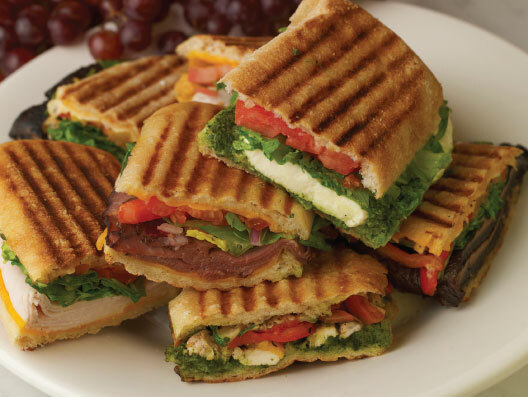 Cafesano's paninis are the favorite lunch time treat for, well, anyone who has ever eaten here! In 2003, when Paul Swinley opened Cafesano in South Lakes Village Center, he wanted to create a restaurant that combined quick-casual dining with top quality food in a comfortable environment--he didn't see why any of those things needed to be independent of each other. He thought Reston needed a spot where people who wanted a quick bite to eat could also enjoy a fresh, tasty meal--with a glass of wine or beer as well. Everyone in Reston agreed. Cafesano was a success from the moment it opened its doors. Today, this locally owned gem is a favorite for residents and people who work in the nearby office buildings. "My favorite lunch spot in Reston," is a common refrain from anyone who has eaten here. No matter when you drop by, there will be a steady stream of people coming through to enjoy pizza, paninis, and kabobs (and, of course, baklava). A combination of Italian and Mediterranean flavors, the primary rule at Cafesano is that the food be fresh. That combined with great customer service and a sleek, comfortable dining area with amazing views of Lake Thoreau contributed to Northern Virginia Magazine naming it the best restaurant in Northern Virginia for lunch in 2012. Paul's goal is always to give his guests a memorable dining experience by providing them with flavorful food and outstanding customer service. Drop by and visit--you'll agree that Cafesano is one of Reston's locally owned treasures!